Directed by Jessica Gomula-Kruzic. 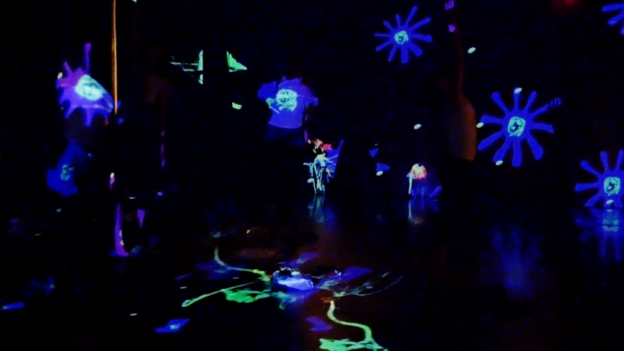 Choreography from Nicole Zvarik’s “Passages.” Audio design by Sean Clute. Disordered Passages is exploration of inward journeys within an artificial world. At first, the dancers’ journey take them into an exploration of other, as they embrace one another in rotating duets. As their journey progresses they move towards individual introspection, literally peeling off layers of themselves to reveal what lies beneath. Juxtaposed against the dancers’ inwards journey, the natural imagery becomes increasingly unreal. As real projections of stylized flowers is layered with secondary processing, the dancers move through a fluctuating landscape which questions what is real and what is synthetic. As the dancers become enveloped in counterfeit nature imagery we become increasingly aware of the constructed world we immerse ourselves in, a manufactured world that tries to circle back to the natural world, to the plants and living land that sustain us. The sense of artificiality is heightened through the digital interruptions and manipulations of the video medium. The plants overtake the dancers at times, immensely large and luminous, blossoming and entangling themselves. Ominous, they ultimately fall back into a fertile landscape of fabricated abundance. The dancers, likewise spiral and entangle themselves, climbing over one another, peeling off layers of clothing and social pretense. “Indeed, in Disordered Passages (2017), she represents dancers of a heroine’s journey, choreographed by Nicole Zvarik, in a deconstruction of feminine nature imagery. The mélange of dancers against brightly colored projections like flashes of light confuse and disorient the viewer as if there were many more bodies present, twisting and turning in space. The viewer moves between the physicality of the dance and their ever present awareness of the video medium it is viewed through. In this vein, the viewer’s journey through the piece echoes that of the dancer, enticing the viewer into becoming a participant in the journey itself.” Stanislaus State Art Faculty Exhibition 2017 Catalog. Staci Scheiwiller.